Our 1 Bedroom Cottages are self-contained including linen, fully-equipped kitchen, comfortable living areas, and private balcony. The Cottage provides 1 bedroom with queen size bed and bathroom with laundrty facilities. Our Cottages are set on 6 acres of manicured gardens and lawns. 1 Bedroom Cottages sleep 2. Our 2 Bedroom Cottages are self-contained including linen, fully-equipped kitchen, comfortable living areas, and private balcony. The Cottages provide 2 bedrooms and bathroom with laundry facilites. Our Cottages have beautiful views across 6 acres of manicured gardens and lawns some with views all the way to the lagoon and beyond to the lakes. 2 Bedroom Cottages have one queen and two singles, sleeping a total of 4 people. some cottages have 1 bunk and 1 single sleeping a total of 5 people. Please advise when making a booking. The 3 Bedroom Cottages are self-contained including linen, fully-equipped kitchen, comfortable living areas, and private balconies. Please note that some 3 bedroom cottages have an external staircase leading to the 2nd and 3rd bedrooms which may not be suitable for young children. 3 Bedroom Cottages can sleep up to 6 people. Our 1 bedroom Spa Villas are self-contained including linen, fully-equipped kitchen, comfortable living areas with TV/DVD, laundry, and private balcony. The Villas provides 1 bedroom with Queen size bed, 1 bathroom with spa and living areas, perfect for couples. Our Villas have beautiful views across 6 acres of manicured gardens and lawns some with views all the way to the lagoon and beyond to the lakes. Our 2 bedroom Spa Villas are self-contained including linen, fully-equipped kitchen, comfortable living areas with TV/DVD, laundry, and private balcony. The Villas provides 1 bedroom, 1 bathroom with spa and living areas upstairs. Downstairs has 1 bedroom containing a queen and a single, with bathroom, perfect for couples, friends and families and are able to sleep 5. Our Villas have beautiful views across 6 acres of manicured gardens and lawns some with views all the way to the lagoon and beyond to the lakes. Our 3 bedroom Spa Villas are self-contained including linen, fully-equipped kitchen, comfortable living areas with TV/DVD, laundry, and private balcony. The Villas provide 1 bedroom, 1 bathroom with spa and living areas upstairs. Downstairs has 2 bedrooms; one containing a queen and single, the other with two sets of bunks, and a bathroom, perfect for couples, friends and families and able to sleep 9. Our Villas have beautiful views across 6 acres of manicured gardens and lawns some with views all the way to the lagoon and beyond to the lakes. McMillans is dedicated to ensuring that each of its guests has the setting, space, and service they need to make their vacation a truly memorable experience. With the luxury of a resort and the comforts of home, McMillans of Metung Resort offers its Guests and unforgettable experience. Set across 8 acres of manicured lawns studded with ancient eucalypts with its magnificient villas and cottages. McMillans provides a perfect getaway that guests can make their very own. McMillans of Metung Resort is an extraordinary setting for an unforgettable stay. 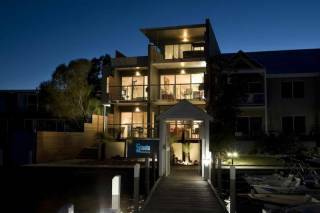 Ideally located on the edge of the Gippsland Lakes in the stylish village of Metung, at the centre of Victoria's aquatic playground. Metung is a picture-perfect village almost surrounded by waters and boats. The waters bring an abundance of birdlife, dolphins and great fishing. There is safe swimming for the children, and numerous walking tracks to explore. All our villas and cottages are self-contained including linen, fully-equipped kitchens, comfortable living areas with TV/DVD, laundry, and private balconies with garden or water views..
McMillans of Metung accepts the following credit cards - Mastercard, Visa and AMEX (a 3.3% surcharge applies to AMEX). Bookings that have been made within 24 hours of the arrival date need to call McMillans of Metung. If less than 60 days notice of cancellation is received your full deposit is forfeited unless the room can be relet, in this instance a partial refund maybe available. In the event of your plans being changed, more than 7 days notice will receive a full credit, less a service charge of $50. If less than 7 days notice of cancellation is received your full deposit is forfeited.